How Can You Tell if Eggs Have Expired? The video above features a lecture by Del Bigtree,1 an Emmy award-winning producer of "The Doctors" talk show for six years, and one of the producers of the documentary "Vaxxed." I actually attended and saw the talk he gave during the 2017 "Truth About Cancer Live" event in Orlando, Florida, where I was also speaking. He focuses on vaccine safety and freedom of choice. This presentation was designed to be shared with those who think vaccine safety advocates are foolish and need to "get with the program." This is one of the best presentations I have seen that could have many rational and objective people change their views on vaccines, so feel free to widely share with those who are in favor of vaccines. "I am a super fan of science," he says. "When we talk about vaccines, and if you question vaccines, you are said to be anti-science. The opposite is actually true … and today I'm going to prove to you [that] the science of vaccines has been fraudulent; it's a lie, it does not exist, and I want you to march out and demand that science begin immediately." The official refrain repeated by most mainstream media is that vaccines have been thoroughly researched and "hundreds" of studies have proven they're safe, and that no link between vaccines and health problems such as autism have ever been found. Unfortunately, this simply isn't true. Importantly, the industry has long shied away from evaluating vaccinated versus unvaccinated populations to determine general health outcomes. One such study2 was finally published earlier this year, and its findings were less than encouraging. Here, they examined health outcomes following the introduction of diphtheria-tetanus-pertussis (DTP) and oral polio vaccine (OPV) in Guinea-Bissau, which took place in the early 1980s. This population offered the rare opportunity to compare vaccinated and unvaccinated children due to the way the vaccines were rolled out. What did they find? According to the authors, "DTP was associated with fivefold higher mortality than being unvaccinated," and "All currently available evidence suggests that DTP vaccine may kill more children from other causes than it saves from diphtheria, tetanus or pertussis." 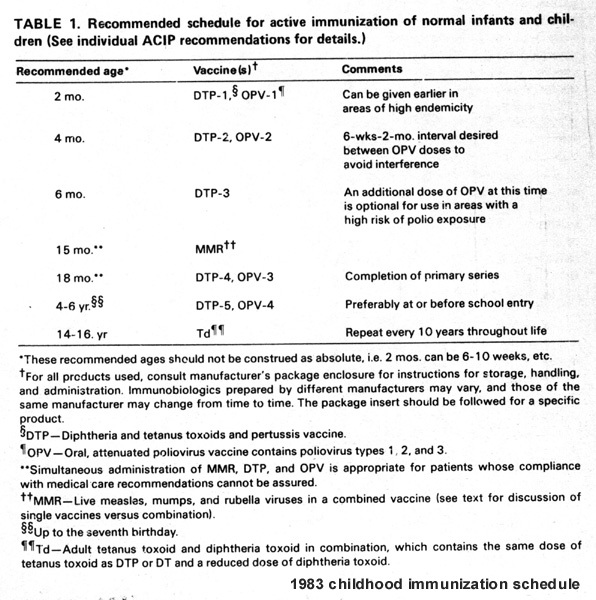 In other words, the researchers concluded the DTP vaccine weakened the children's immune system, rendering them vulnerable to a whole host of other, ultimately lethal, diseases and health problems. Other West African trials revealed a high titer measles vaccine interacted with the DTP vaccine, resulting in a 33 percent increase in infant mortality.3 In this case, this shocking finding led to the withdrawal of that measles vaccine. But what would have happened had those studies never been done? Clearly, we need many more like them. In the U.S., federal health officials recommend that children receive 69 doses of 16 vaccines between the day of birth and 18 years old, with 50 doses given before age 6. How does this affect their health? And is anyone actually tracking the health outcomes of the federal childhood vaccine program? The answer, I'm afraid, is no. We do not know if and how all of these vaccinations are affecting the general health and mortality of our children. We do, however, know that the U.S. has one of the highest infant and maternal mortality rates of any developed nation, and we also have the highest vaccination rates. What Do Statistics Tell Us About Vaccine Safety? Barring large-scale studies comparing unvaccinated and vaccinated populations, general health statistics can give us an inkling as to how well the U.S. vaccination program protects our children's health, and it doesn't look promising. Making matters worse, manufacturers of vaccines that are on the childhood schedule are not legally liable for brain damage or other types of injuries occurring from the administration of these vaccines. This is stark contrast to every other industry, where the manufacturer is financially liable and accountable in a civil court of law for faulty, malfunctioning or unsafe products. Vaccine manufacturers (and vaccine providers), on the other hand, were granted partial immunity from liability in the 1986 National Childhood Vaccine Injury Act, after the vaccine industry threatened to cease making childhood vaccines for release in the U.S. unless they were protected from being sued in civil court for damages. Then, in 2011, the U.S. Supreme Court effectively handed vaccine manufacturers a total liability shield from lawsuits for harm caused by FDA-licensed vaccines recommended for children — even if there is evidence the vaccine could have been made safer!6 The consequences of this are staggering. As a result of Congress and the U.S. Supreme Court removing civil liability for vaccine injuries and deaths, vaccine makers have no incentive to conduct safety studies on their vaccines pre- and post-licensure; the FDA has no incentive to maintain high standards for proof of new vaccine safety; the CDC has no incentive to make vaccine policies safer; NIH has no incentive to fund research into vaccine side effects and high risk factors that make some individuals more susceptible to vaccine harm; and the federal vaccine injury compensation program (VICP) created under the 1986 law has little incentive to make awards to the vaccine injured. Nevertheless, the net result now is that vaccine manufacturers have gotten a free pass when their products cause vaccine injuries and deaths because the only possible way a vaccine injured person in the U.S can sue a manufacturer is if the company possesses evidence a vaccine causes a particular problem and failed to disclose it to the FDA. If pharmaceutical companies plead ignorance about vaccine side effects because, for example, they didn't fully investigate potential side effects, they're in the clear! Adding insult to injury, if you or your child suffers a permanent injury or dies after getting a federally licensed and recommended childhood vaccine and you file a VICP claim, it is now your responsibility to prove causation. That's right, it's now up to you, your lawyer and whatever experts you can afford, to identify the science to explain your or your child's injury and argue with U.S. Department of Justice attorneys representing the U.S. Secretary of Health and Human Services about why you or your child should receive compensation. As noted in this lecture, safety studies for vaccines are nothing like what you'd expect. While drugs are typically studied for side effects over a number of years, the hepatitis B vaccine, for example, which is injected into newborn babies, had a safety review period prior to licensure of four days (GlaxoSmithKline's brand, Engerix) and five days (Merck's Recombivax). On top of that, no placebo group was included, making it all the more difficult to discern whether a problem might be related to the injection. The polio vaccine has a safety review period of just 48 hours. What this means is if the child died on day three, it didn't count, because they were no longer looking for or tracking potential side effects. Here, the subject group received the polio and DTP vaccine, while the so-called "placebo" group received only the DTP vaccine — the same vaccine that provided evidence it raised mortality in African children fivefold. This is NOT the way to establish vaccine safety, and this is what everyone is referring to when they say "hundreds" of studies have "proven" vaccines are safe. Some 270 experimental vaccines are already in the pipeline. How many of those will be added to the CDC's schedule of recommended childhood vaccines that are turned into school mandates in the states? How many can a child bear? Where is the breaking point? And how do we know a breaking point has not already been reached? Judging by our health statistics, I'd suggest we've passed the breaking point already. Vaccine safety is further hindered by the fact that the U.S. Department of Health and Human Services (DHHS), which is in charge of vaccine safety, is also in charge of promoting vaccines to the public and defending vaccine safety in court! (When you file a VICP vaccine injury claim, you're actually suing the U.S. government, not the vaccine maker.) These conflicts of interest seriously hamper the DHHS' ability to fulfill its mandate to make sure all vaccines are safe. But it doesn't end there. The Advisory Committee on Immunization Practices (ACIP), which tells the Centers for Disease Control and Prevention (CDC) which vaccines should be included on the recommended childhood vaccination schedule, also has significant conflicts of interest. In this case, some panel members have been found to have financial ties to the drug companies making and selling the very vaccines they're voting to include on the schedule. "The CDC grants blanket waivers to the ACIP members each year that allow them to deliberate on any subject, regardless of their conflicts, for the entire year … [ACIP reflects] a system where government officials make crucial decisions affecting American children without the advice and consent of the governed." Last but not least, the CDC, which also has a role to play in vaccine safety, spends $4.9 billion of its annual $11.5 billion budget on the purchase and promotion of vaccines. Now, if any FDA licensed and CDC recommended vaccine were found to be dangerous, what incentive does the government have to pull it off the market? Federal agencies have basically morphed into becoming funders, advertisers and product distributors for the vaccine industry. The CDC even holds at least 27 human vaccine-related patents, plus another five patents for veterinary vaccines,11 which dampens the agency's incentive to find or acknowledge any safety or effectiveness issues with vaccines. The revolving door between government agencies and the industry adds further complexity to these conflicts of interest. In his presentation, Bigtree addressed the federal vaccine adverse event reporting system (VAERS). VAERS was a vaccine safety provision included in the 1986 National Childhood Vaccine Injury Act and is a passive reporting system. As such, it suffers from the same malady as other passive reporting systems, which is underreporting. Research has confirmed passive reporting systems underreport by 50-to-1, meaning only 1 in 50 adverse events are ever reported. In the case of VAERS, published estimates suggest only between 1 and 10 percent of serious health problems that occur after vaccination are ever reported,13,14 so VAERS may have an underreporting rate as high as 100-to-1. This means that for every vaccine adverse event report that makes it to VAERS, it may need to be multiplied by 100 to get closer to reality. Under the 1986 law, doctors and all vaccine providers have a legal obligation to report vaccine side effects to VAERS, but they don't, and there are no legal sanctions or professional ramifications for failure to make a report. Parents can also make a vaccine reaction report to the VAERS database themselves, and I encourage all parents to do so, should your child experience a vaccine reaction and your doctor or vaccine provider refuse to make a report. In 2016 alone, 59,117 reports were added. According to Bigtree, these included 432 deaths, 1,091 permanent disabilities, 4,132 hospitalizations and 10,284 emergency room visits. Again, you likely need to multiply these figures by 100 to get a more accurate estimate of how many vaccine-related health problems have really been occurring in the U.S. This means the annual vaccine-related death toll may be closer to 43,200, and permanent disabilities may number around 109,100. Mind you, that's just in one year. Regardless, as Bigtree notes, "This is no way to conduct science." How can you assess harm when you likely have only 1 percent of the data? In 2010, the CDC had the brilliant idea of hiring a company to automate VAERS in such a way that any potential vaccine reactions reported to doctors participating in the Harvard Pilgrim HMO would automatically be uploaded into the VAERS database. What did they find? Preliminary data showed that out of 376,452 individuals given 45 different vaccines, 35,570 possible vaccine reactions were identified. This means nearly 1 in 10 people suffered a reaction after vaccination concerning enough to be reported, yet the official CDC mantra is that the risk for serious vaccine injury or death is 1 in 1 million. Alas, while creation of VAERS in the 1986 law presented an opportunity to finally get a better understanding of the number of potential vaccine reactions, injuries and deaths occurring after vaccinations given in the U.S., the CDC didn't follow through. According to the company hired and paid $1 million to create this automated reporting program, "There was never any opportunity to perform system performance assessments because the necessary CDC contacts were no longer available and the CDC consultants responsible for receiving data were no longer responsive to our multiple requests to proceed with testing and evaluation." Neil Z. Miller, author of "Miller's Review of Critical Vaccine Studies," downloaded the VAERS database and created a program to extract all reports involving infants. In all, there was an extraction and analysis of the reports of 38,000 infants who experienced an adverse reaction following the receipt of one or more vaccines to determine the number of vaccines each infant had received before suffering an adverse reaction. Bigtree also summarized vaccine safety reports issued by physician committees at the Institute of Medicine (IOM) in 199115 and 1994.16,17 These reports were among the vaccine safety provisions included in the 1986 National Chlldhood Vaccine Injury Act. Both IOM committees found much of the evidence in the medical literature was too inadequate to be able to ascertain whether nine government-recommended childhood vaccines reviewed were — or were not — causing commonly reported health problems. Another IOM report, published in 2012, "Adverse Effects of Vaccines: Evidence and Causality,"18 is one of the most important reviews of scientific evidence about vaccine injuries and deaths. This report summarized evidence for 155 reported vaccine-related adverse effects associated with eight government-recommended childhood vaccines. Out of 155 health problems reported after vaccination, 134 of them could not be evaluated due to a lack of enough methodologically sound scientific studies! The vaccine-related health problems being evaluated include very serious effects such as encephalitis, seizure disorders, multiple sclerosis, psoriatic arthritis and much more. Clearly, vaccine science is simply either not there or not solid enough for rational conclusions to be made about cause and effect. Although vaccine safety advocates have criticized the IOM's reports as minimizing the full extent of vaccine risks, no other recognized scientific institution in the world has so clearly acknowledged that vaccines can and do cause injury and death, especially for susceptible individuals, and that there are large vaccine science knowledge gaps about safety that need to be addressed. This is important because many of the studies the CDC relies on as evidence that vaccines don't cause any problems are epidemiological studies and, if poor methodology is used, the conclusions of epidemiological studies can be fatally flawed. In the 2012 review, the IOM committee reviewed both kinds of science. The most shocking conclusion of this report is that, for more than 100 adverse health outcomes reported after these eight vaccines were given, the IOM committee was unable to determine whether or not the vaccines caused a commonly reported brain or immune system disorder. In short: The scientific evidence was insufficient to make a conclusion in most cases. All of these facts point to why we simply must protect flexible vaccine exemptions in federal vaccine policies and state vaccine laws. We must have the right to choose and refuse. Moreover, when an individual experiences a deterioration in health after vaccination, doctors also need to understand the danger of giving more vaccinations until or unless the vaccine can be conclusively exonerated as a causative or contributing factor to that health deterioration. And guess what? There are well over 100 brain and immune system disorders associated with vaccination for which there's insufficient science to ascertain whether or not the vaccine might be a causative factor. What this tells us is that physicians — or anyone — recommending and administering vaccines to people, particularly to vulnerable infants and children, need to apply the precautionary principle of "first do no harm" and respect the human right to exercise informed consent to medical risk taking, including vaccine risk-taking. This is critically important when the foundation of science supporting the safety of any given vaccine, alone or in combination, for any given individual is so weak. 7 U.S. Supreme Court. Bruesewitz v Wyeth. Feb. 22, 2011. 15 Institute of Medicine (1991). Adverse Effects of Pertussis and Rubella Vaccines. 16 Institute of Medicine (1994). DPT Vaccine and Chronic Nervous System Dysfunction: A New Analysis. 17 Institute of Medicine (1994). Adverse Events Associated with Childhood Vaccines: Evidence Bearing on Causality. Next Article How Can You Tell if Eggs Have Expired?